This ride explores the hills and valleys to the southwest of the town of Sebastopol. It contains quite a few hills and at least one mile of heavily traveled highway, so it is not recommended for novice riders. The route begins at Ragle Ranch Park on the western edge of the small city of Sebastopol. Famed horticulturist Luther Burbank maintained his Gold Ridge experimental farm just a mile from Ragle Park. One of his chief contributions to the local agricultural community was the introduction of the Gravenstein apple as a commercial crop in the Sebastopol foothills. Throughout the 20th century, Sebastopol was known as the Gravenstein Capitol of the World, and orchards covered almost every open acre around the town. Sebastopol still celebrates this heritage in its April Apple Blossom Festival. But agricultural economies evolve, and over the past decade, more and more of the orchards have been ripped out, to be replaced by pinot noir vines. This is a long way of saying that one can still see some of the remaining orchards in the early miles of this ride and again near the end in the rumpled quilt of hills to the west of the town. They haven’t all disappeared yet, and they lend a unique look to this ride not encountered anywhere else in Sonoma County. If you happen to be doing this ride in the early weeks of April, you may be lucky enough to see the venerable orchards in bloom, brightening the hills with their pink and white popcorn. The first five miles or so of the ride are within the range of what might have once been orchard country. Over that distance, the roads bump up and down over a series of many little hills. Where you don’t see orchards, you will see their replacement: vineyards. But there are also many acres of woods and a few meadows for sheep and cows and recreational equestrian pursuits. Although the entire region is distinctly and pleasantly rural, little of it is actual wilderness: there are homes scattered throughout the woods. The population density and the style of the homes is somewhat suggestive of a human-scaled Hobbitville. These hills are home to apple farmers, sheep ranchers, organic gardeners, winemakers, artists, and many others who just like living in the country, from plain folk to yuppie commuters to unreconstructed back-to-the-land flower children, most of whom migrated here from San Francisco over the past 50 years, pursuing the vision of an agrarian nirvana. Some of the most celebrated and notorious of the hippie communes called these hills home, and while things have settled down some since those halcyon days, there are still numerous extended families living out their alternative dreams up at the ends of the long, dirt driveways you’ll pass on this ride. At about mile 5, the route encounters its first really big climb. This is along Graton Road. It gains almost 500’ over the course of a couple of miles. It is never a hard climb, but it still feels substantial. It is the first real climb of the Santa Rosa Cycling Club’s Wine Country Century, and on the first Saturday in May each year, it is crammed with riders getting up the grade at whatever tempo works best for them. 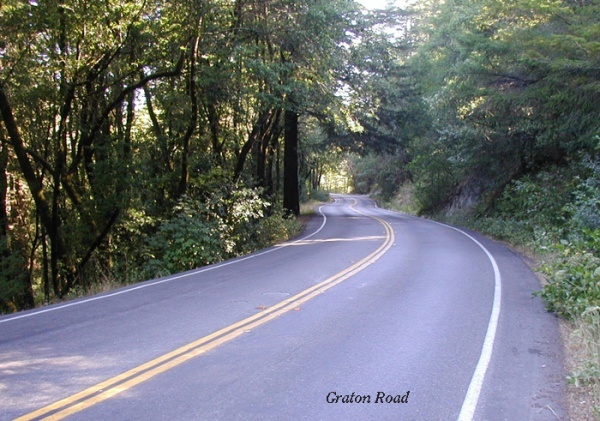 Over the top of that climb, Graton Road descends for a mile to the village of Occidental. Our route slip calls for a rest stop here, although it’s only eight-plus miles into the ride. This is probably because local club rides always stop in Occidental, no matter the miles. The route turns left here and heads south on Bohemian Highway, beginning with a smooth, sinuous downhill through the trees, a really entertaining bit of gravity candy. Once the zippy part of the descent peters out, this nice road rolls easily through meadows and scattered woodlots to the quaint village of Freestone. If you can’t stop here, at least slow down, sit up, and look around as you pedal through. It’s a lovely village...a designated historic district. There’s a wonderful bakery in Freestone—Wild Flour Bread—where they will be pulling hot loaves, sticky buns, and cheese fougasse out of their wood-fired brick ovens as the riders roll past. As was the case in Occidental, it’s a little early for a rest stop, but it’s hard to pass by, with the baking smells wafting out into the road. After Freestone, you have to endure one mile of busy, no-shoulder Bodega Highway before escaping onto another little road to another little town—Valley Ford. This is a quiet village serving the needs of nearby farms (mostly dairies). This is a spot where cyclists often take a break, sitting on the porch in front of the store. Valley Ford’s one and only claim to fame is that it was the site of Christo’s Running Fence, one of that artist’s more successful projects. There are two roads south out of Valley Ford, heading in the direction we want to go. The first is Estero/Franklin School Road and the second is Middle Road. The route ends up on the former, but starts out on the latter and then doubles back on a little connector road (Marsh). If you study the map, you may come to the conclusion that we have you doubling back like this a couple of times. We do. We’re not going out of the way to be needlessly confusing or to pad the miles. It’s true, we haven’t chosen the straightest path, but we have chosen the one that offers the best combination of scenery and interesting climbs. When the route leaves Valley Ford and turns further south on Middle Road crossing the Estero Americano, we roll into neighboring Marin County along its northern border. We love this empty, tranquil country (so unlike the busy suburbs of southern Marin). It has a different look from the steeper, heavily wooded hills on the more northern portions of this loop, where redwood groves are not uncommon. Here, the lower hills have a softer, more pillowy feel and are generally free of dense forest. There are isolated stands of eucalyptus and cypress here and there, and gnarled creek willows cluster down in the gullies, but most of the hills wear only grasses and wildflowers. The bulk of this stage runs through prime dairy country, and our constant companions today will be thousands of grazing Holsteins, placidly converting those hillside grasses to butterfat. Herds of sheep also call these hills home, but very few humans do. The farms are large and the towns are tiny, few, and far between. There is nothing out here to attract tourists. There are no creekside vacation homes, no coastal condos, no roadside attractions, in fact few commercial enterprises of any sort, except farming. Almost all of the roads carry very little traffic. In short, it’s just about an ideal place to ride a bike. We head south out of Valley Ford along Middle Road and then double back on Marsh Road to Franklin School Road. Here we encounter another fairly ambitious climb: first a smaller, rolling grade out of the Estero Americano drainage, then a gradual descent, and finally a climb of about a mile over the grassy ridgeline. Down the other side on a steep, fast flier, and then left on Whitaker Bluff Road and up onto the namesake bluff. Stop for a minute up on this high crown of road. It’s a lovely, quiet spot, with the Estero San Antonio scrawling lazy loops along the little valley below. Sheep graze the meadows, egrets and herons stalk the shallows, and hawks circle overhead. Foxes are sometimes seen, scampering across the road. After having zigged west on Marsh, Whitaker Bluff zags us back east. Three miles heading east bring us to a left on Hwy 1, heading back toward Sebastopol again. This particular section of highway, for a variety of reasons, is very lightly traveled. Scenery is more of the same: rolling, grassy hills, dairies and the pastures for their cows, and the occasional groves of trees that shelter down in the stream bottoms. Hwy 1 climbs in a couple of easy stair steps to a low summit, then glides downhill almost all the way to our next junction, where Hwy 1 bears away north and west toward Valley Ford and we turn right and head east on Petaluma-Valley Ford Road. This nearly level run through the dairylands brings us to the little town of Bloomfield. There are no commercial services in Bloomfield, except for Stormy’s tavern, where they make killer clam chowder to go. (There’s room in your jersey pocket!) The road out of Bloomfield is—surprise!—Bloomfield Road. We’ll be on it for five miles, and over that distance, we will climb three modest hills. The second of these is the biggest, with a summit just beyond the Burnside Road junction, and it also has the longest downhill off its far side: a pretty speedy drop into Blucher Valley. By the time we complete the last of the three climbs, we are flirting again with the orchard country around Sebastopol and we’re also back into that fringe of rural-residential, Hobbit-style housing...one to five-acre plots. Bloomfield Road connects to Pleasant Hill Road, and this aptly named lane will carry the riders all the way back into town and to within a block or two of the finish at Ragle Park. Once up the last, gradual climb on Bloomfield, the balance of the route along Pleasant Hill is draped across the rolling, orchard (or vineyard) covered hills, with no significant climbs and one long but gentle descent. Traffic of course builds a little as the route approaches town, but it never becomes a serious problem.